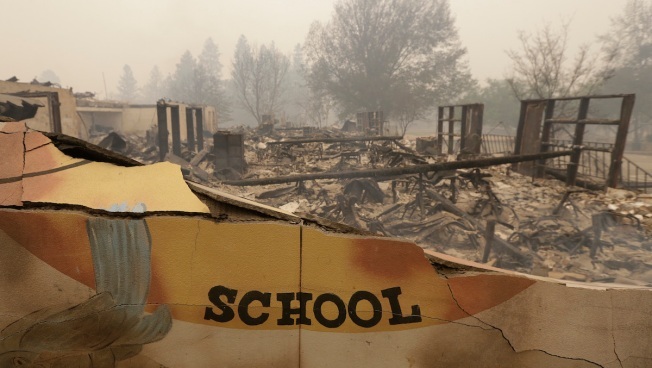 The burned remains of the Paradise Elementary school is seen Friday, Nov. 9, 2018, in Paradise, Calif. Blocks and blocks of homes and businesses in the Northern California town have been destroyed by a wildfire. Teachers, aides and bus drivers in Northern California loaded more than 100 school students into cars and school buses as a fast-moving wildfire approached, driving hours through smoke and flames to safely reunite the children with their families, according to one of the teachers who helped get people to safety. Marc Kessler, a science teacher at a Paradise Unified School District middle school, said he arrived at work early Thursday and saw smoke plumes that soon grew uncomfortably near. He and others quickly realized they would have to leave as the sound of propane tanks exploding in the heat got closer. A sheriff's deputy arrived and told them to get to Chico, a nearby city. "He said seat belt laws don't apply, and he said stuff as many kids as you can in the cars," Kessler told The Associated Press on Friday. Kessler, 55, drove off after convincing three middle-school boys to go with him. The students didn't want to leave in case their parents showed up. He worried there were not enough cars for the students, but he later learned that a bus driver pulled up to the school. "It was just what we needed," he said. Kessler said that in all, six school buses — along with teachers, aides and administrators — ferried out the children from the district's schools to evacuation centers in Chico and Gridley. They plowed through smoke, burning debris and flames, driving hours on gridlocked country roads. "There were trees burning on the side of the road. The smoke was so thick you couldn't see," he said. "We had very traumatized teachers who were certain they were going to die in the car with their students." What should have been a 20-minute commute turned into a two-hour drive for him and a four-hour drive for another, he said. 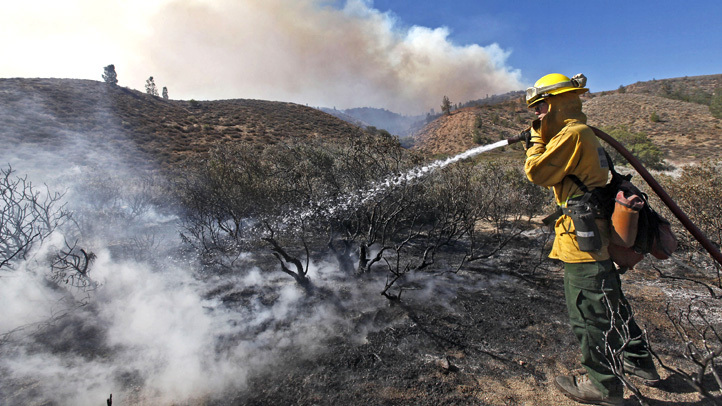 He drove through smoke but was spared active flames from the deadly wildfire, which grew into the state's most destructive fire in at least a century. One student sat in the front, trying to call their parents on a cellphone. They reached one parent, a truck driver "who was just beside himself with joy" to hear that his son was safe. He could tell the boys were scared, but they kept it together. They reunited 125 students from kindergarteners to high school seniors with their families, mostly by Thursday night with a few early Friday. Some parents had had no contact with their kids for eight hours. They arrived stressed out and panicked. Kessler can't say enough good things about the bus drivers. "I don't know if the bus drivers took it upon themselves or if they were asked to come by, but it was pretty awesome. They have family up there, homes — and they chose to come to the school and take those kids down."